Dogs are really social animals and love to have someone with them at all times. There is nothing harder than doing a last visit at night and having to leave them until the morning. We asked our pet sitting fan base on Facebook to provide info on how they perform overnight pet sitting for their clients. Overnight pet sitting usually is a 12-hour stay. Pet sitter will often bring own food, drink, linens and laptop. Pet sitter will follow all typical rules and routine already established for pet. Works best when client provides plenty of detail of pet’s overnight habits. Evening and morning walks are typically included. It’s helpful (very helpful) to show how TV remote actually works! We offer 2 over night services: Gold Overnight is a standard visit for dinner sometime between 4pm and 6pm. The sitter leaves and come back to stay from 1030pm to 7am….So late night potty break and the morning route are done. The other option is the Platinum Overnight which is a 12hour continuous stay over night (like 8pm to 8am). We sleep wherever the client tells us… so if fluffy sleeps with them in bed, then fluffy sleeps with us in bed :-). Some clients leave food, and we appreciate it….but it’s not necessary. Client can make the process easier by explaining their pets overnight behavior. Some clients neglect to tell us fido gets them up every 45 minutes to bark at the moon. Lol. Overnights is where I arrive anywhere between 5 – 8pm and leave anywhere from 5 – 8am. This usually includes one walk either when I arrive or before I leave depending on the client’s requirements. I bring myself, my laptop and some food. The client may provide food and (naturally) the animal as well as a bed. This is a better option than visits as someone is there OVERNIGHT. This is great for the safety of the property as well as the animals plus a lot of animals are used to company of a night more than during the day thus less noise from dogs and the cats are not neglected either. 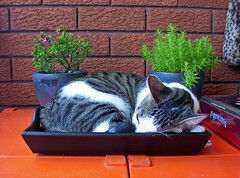 In re cats, it ensures they are inside of a night as well. As for what the client can do to make the process more pleasant… give us as much information as possible about the pet(s) as well as the home. Even if it means multiple emails and like a novel, as long as we have this information, it ensures that nothing can surprise us. Plus the clients have to remember esp. at first that we don’t know their pets like they do – every little behaviour needs to be mentioned (they may forget as it’s “normal” to them). We start our overnight pet sitting at 8 pm, although it’s usually a little earlier and leave about 7 am. Visits include the evening and morning walk. I will usually bring blankets/pillows as I usually prefer to crash on the couch instead of a bedroom, even when they insist. Usually I’ll bring my laptop and something to drink. I tell my clients that overnights start between 8-10pm and end between 6-8am. I give a range so that if I have another client that is away and I need to do last visits and morning visits I have the flexibility to do that. Having said that, I usually go around 5-7pm and get settled in with the pets. If I need to go out again I will leave from their house. If I don’t need to go out again it is nice to get situated for the night, relax and spend extra time with their pets. Depending on how many overnights I am doing in a row, I will usually bring my own pillows, bathroom items, food and laptop. There have been many times my clients have left food for me which was a really nice treat. For some pets 3 to 4 visits a day work fine. I think the client can make it easier by reviewing everything in the house. Letting us know what the routine is……when do they usually go to bed, what time is the last let out, what time do they usually get up in the morning, where in the house do they usually sleep. How the remote for the tv works……every remote seems to be different! I have found the ones that I enjoy the most are the clients who treat me like they would treat a guest in their home. Ditto with Dave’s ideas. I also like to sleep on the couch and bring my own linens so that sheets do not need to be changed and laundered. If its a big enough sofa, all the dogs are welcome as long as I have room too:) I offer my overnights from 7pm to 7 am and provide feedings and walks with the service. I am always careful to leave the home just as I found it and go to my other sits right from there in the am. I never get any sleep when I do overnights so I only do once in a while and for special needs pets. We are fortunate that our clients that utilize our overnight services. make us feel very welcome & comfortable. (Had one pet parent buy a new TV for guest rm. for us!) Recently, raised our rates for overnight visits; haven’t noticed any change in bookings. It is a challenge to find I.C./Employees who are willing to do overnights but I’m convinced it’s a svc. worth offering. We offer overnight service which starts at 10PM to 8 AM…with that is a dinner visit included. Then we discount our mid days to the client who is already booked for overnights. Depending on how long the stay is and who the sitter is we stay in a guest room, stay on the sofa or even bring our own air mattress along with personal belongings and a couple snacks. The client can make it easier by showing us how to work the TV as they are all different and making sure we know all the details. I like clients who leave a note each time we come to visit with their pets… just something short and sweet like what time they really ended up leaving (last time pup was out) and any last minute details they forgot to mention or reminders such as don’t forget the trash goes out on Thursday! I found overnights to be highly in demand and still had a few clients who absolutely would not let me decline working with them after I terminated many of my services. I always was on premises from dark until dawn and intermittently during the day depending on the load. My client base had a guest rooms for me and I would often base my operation out of their home until the assignment was done. Most were week long or more. We offer overnight services, usually my husband or I do them. The time varies, depending on what else we have scheduled and what the pet’s routine/special needs are. We’re usually there around 7:00 pm to 7:00 am. We’ll do morning and evening walks with the dogs. Sometimes we may come earlier in the evening and take care of feeding, walking or potty breaks, then take off for an hour or two to do other visits and grab some dinner. If we have morning pet sits elsewhere we may do them and then come back if we have time, depending on where the other sits are and when our mid day visits start. If the dogs like to ride in the car I like to take them out somewhere, a park or something and maybe pick up dinner on the way, so they get out of the house for a while. We offer mid-day visits, but most don’t need it. We’re often in the home more hours a day than the owners! We sleep usually in a guest bed or the client’s bed, whatever they dictate. I have been know to crash on the couch with a pile o’ pups/kitties :D. We bring our own bed linens most of the time, it depends on the client’s situation and how long we will be there. I bring my laptop, something to read, some beverages and snacks, minimal toiletries… just the essentials. I shower at home before I go. The biggest issue is usually how to work the TV! Thank you to all the pet sitters who have contributed to this article. We hope this information on overnight pet sitting has made things clear. Consider this as a possibility next time you travel and ask your pet sitter if this service is currently offered. Your pet will surely thank you. I’ve heard about overnight pet sitting before, but I didn’t know what it entailed until I read your article. It’s good that the sitter can bring personal items during the job. I think knowing the pet’s overnight habits would probably be beneficial to the sitter.